HONG KONG - In Japan as in China, there is a tradition of officials being chosen from members of politically prominent families for senior positions and, often, those politicians exhibit similar political leanings as their forebears. At the very top, Japan’s prime minister, Shinzo Abe, is the scion of a political family. His father, Shintaro Abe, served as foreign minister and his mother was the daughter of Prime Minister Nobusuke Kishi who, though classified as a Class A war criminal, went on to become prime minister in the 1950s. Abe has said that he carries Kishi’s DNA. Similarly, in China, the “core leader,” President Xi Jinping, is the son of Xi Zhongxun, regarded as among the first generation of leaders of the People’s Republic of China. China’s ranks of senior officials are filled with “princelings,” including those who gained their status through marriage. Chinese analyses of Japanese officials often take into consideration the political dynasty from which they spring. Thus, when Yasuo Fukuda became Japan’s leader in 2007, China rejoiced because his father, Takeo Fukuda, as prime minister, had signed a treaty of peace and friendship with China in 1978 and initiated economic aid for China. The trust in the younger Fukuda proved well placed when he, both while in office and subsequently, took actions to improve China-Japan relations, including holding a secret meeting with Xi Jinping that led to the breakthrough summit meeting between Xi and Abe in November 2014. Given this history, it was not surprising that in early August, after Taro Kono was appointed foreign minister, the Chinese side should view him through the prism of his father’s political career. Yohei Kono, former foreign minister and deputy prime minister, had, in 1993, while chief Cabinet secretary, issued what became known as the Kono Statement, which asserted that the Japanese Imperial Army was involved in the “comfort women” system in which women were forced to work in military brothels before and during World War II. When Taro Kono was appointed foreign minister, there was general expectation in Japan and abroad that he would follow in the footsteps of his father and seek better ties with China and South Korea. One of Kono’s first official duties was to represent his country in the foreign ministers’ meeting of the East Asia Summit, held in Manila on Aug. 7. China was represented by Foreign Minister Wang Yi. The Chinese hoped that the issue of Beijing’s actions in the South China Sea, including the construction and militarization of artificial islands, would not be raised. 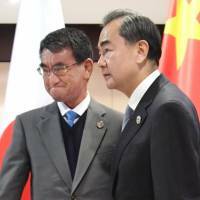 However, Japan’s newly appointed foreign minister refused to play the Chinese game and openly criticized Chinese military construction in the South China Sea. “We strongly oppose any unilateral acts to try to change the status quo based on military power,” Kono said. Wang, a master politician who had previously served as ambassador to Japan, was attempting to use Kono’s father’s reputation to make the Japanese foreign minister more susceptible to Chinese influence. At the same time, he hoped to drive a wedge between Japan and the U.S., its ally. But Kono, who was only four days into the job as foreign minister, rebuffed Wang, a veteran politician who has become increasingly assertive. The two men then had a private meeting, which was subsequently characterized as being marked by a “frank and candid” exchange of views. Hopefully, the public exchange that the two men had before the private meeting led to more productive discussions. It is important for East Asia’s two most important nations to improve their relationship. 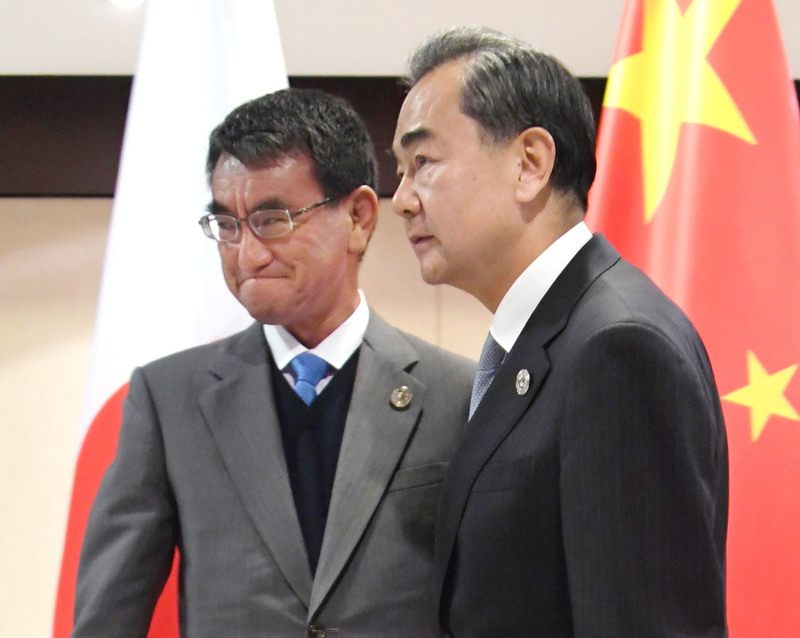 Wang should understand that putting pressure on his Japanese counterpart by invoking his father’s name doesn’t work. He should seriously consider Kono’s advice that China should learn to behave like a big power.